The RB A650X is the highest quality trauma/oxygen bag on the market today. The outer shell is constructed of 1000 denier Cordura® nylon. The interior liner is constructed of nylon pack cloth and high density foam for equipment protection and stability. Liner may be removed for cleaning. Hand wash with mild soap and water, allow to air dry. It holds a “D” or Jumbo “D” oxygen cylinder with access to the regulator through the end pocket. YKK #10 heavy duty nylon zipper is used throughout the bag. The zippers are reversed to eliminate wear on the coil prolonging the life of the strongest zipper on the market. This bag features 6 internal storage pockets that measure 7”H x 7”W x 4”D with clear vinyl flaps to secure contents. There is a large pleated zippered pocket in the interior of the top flap. Two external pockets on either side that measure 8”H x 10”L x 3.5” D and feature 3 slot pockets and 30 elastic loops to keeps small items organized. The reverse side there is a a pocket that measures 8”H x 21”L x 3.5”D that is perfect for neck collars or other oversize items that need to be close at hand. 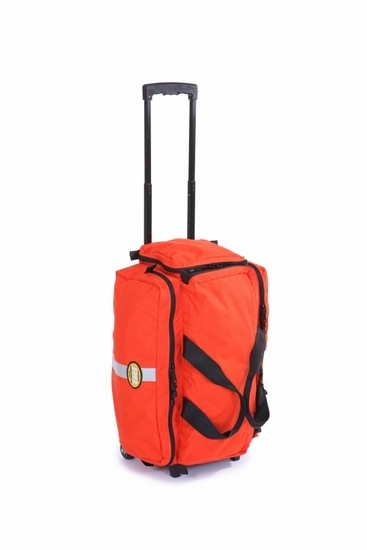 The Roller Mega Medic’s Bag is mounted on an external wheeled frame that that boasts 2” ground clearance, 13” wheel base and a two stage handle that can extend to 44”. All this adds up to a bag that stays clean dry and stable even when the scene is not. Colors: Orange. Wt. 150 oz. Overall dimensions: 24”L x 17”W x 11”H. Made in the USA.